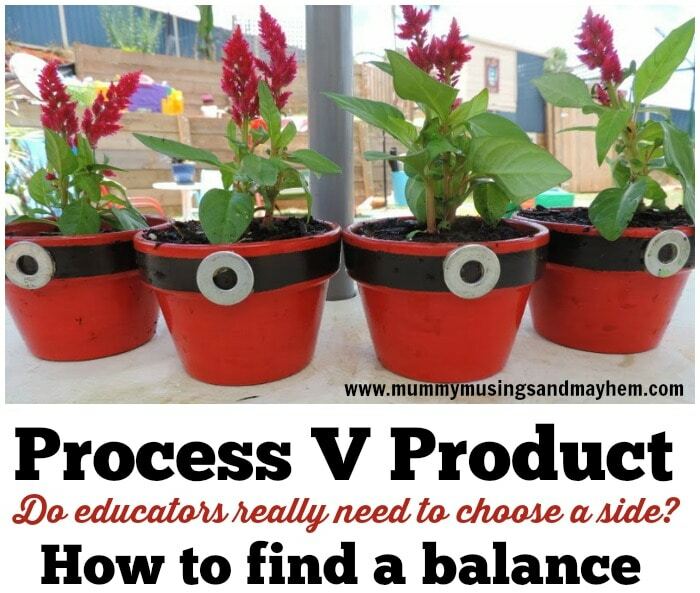 Process V Product in Early Learning – Can we find a balance? Every year in the early childhood field you can be sure that you will come across the process versus product creativity and learning debate. It’s not a new concept and it’s certainly not a bad thing to engage in a little healthy debate among colleagues. Except it has now become a fight among many rather than a healthy debate. Educators are vying to get their important message and personal philosophy across to the other ‘side’ who are quite obviously wrong…and it’s getting nasty in many cases. The rise of social media as an avenue to express professional beliefs and early childhood theory has seen many now find a voice. I’m not one to censor people’s beliefs or desire to get their passionate point across – but I am growing weary and to be honest quite saddened by the vehemency of this debate among Educator Facebook groups and other social media avenues. Debate, conversation and reflection about practice is one thing – words that aim to belittle another educator or parent just because they choose to do something differently is another. I see people getting so caught up in making sure people understand their point of view and the ‘right’ way of doing things that they are losing sight of why we do the important work that we do and why it is always imperative that we remember that the children we are entrusted to nurture and grow are all individuals and should be treated as such. No one philosophy or teaching style suits every child…or indeed all educators or parents. I fear we are losing sight of this fact in these ongoing fights on social media about what is the ‘correct’ way of doing things and who is the most educated and therefore knows best. It has always been best practice to draw upon our own strengths and knowledge as well as those from the theorists and research from years gone past. We must always open our mind to new learning – just as we invite children to do. I’m going to be frank – the Process V Product art debate/argument has been around for a very, very long time – it’s not going away. Why? Because we don’t all teach the same way, children do not all learn the same way. We don’t always follow the path of research and what the ‘experts’ tell us. I’ve been in the early childhood profession for nearly 30 years now in one way or the other and I can assure you that what is ‘the right way’ today will no doubt be different again in 5 years time. The cycles come and go and we continue to learn and try new things. As do children. But when it comes to this debate I think we need to step back from trying to convince others that there must be an absolute. Why do we have a need to separate these two approaches – how are they so different and why it seems must we only choose one? When children engage in process art the aim is that they enjoy the process of making and doing the art – it’s no so much about what the end product turns out to be or if there is even an end product at all. Sounds simple right? This form of art tends to have originated from a preconceived idea from an educator or parent. There are often steps or directions the child needs to follow to make the artwork look the way it is ‘supposed to’ according to the teacher or parent. Educators or parents often do the ‘more advanced’ elements for the child to ensure it all ends up looking ‘right’ and so that a parent will be overjoyed to put it up on their wall or the fridge to display. There is often not much room for individual creativity and self expression. Or is there? I think that sometimes we oversimplify the definition of product art to just cute crafts/gifts for parents that are obviously not age appropriate or colouring in stencils. We therefore don’t allow the opportunity to explore the possibilities of this medium or the obvious extensions and the many benefits for children. 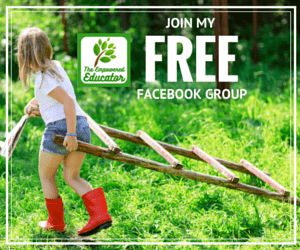 I am a huge champion of play based learning – I have been writing and sharing activities based on this concept here on this blog for nearly 5 years now so please do not doubt my philosophy when it comes to supporting children on their learning journey through play. We embrace and engage in outdoor play and move with the children’s interests and voice every single day . I have been in this game for a while now (as I know many reading this article have to) and I am well aware of the negatives and the benefits of each type of approach so please don’t mistake this post as being either pro process or product. What I am trying to express is that there can be room for both if done well by a skilled educator . We don’t need to draw a line in the sand we cannot step over. We don’t need to limit children, we need to give them credit for knowing what they enjoy doing. The skill is in being able to provide a balance. To think outside the box of what ‘must be done because’ and instead offer a process type medium for children that might also offer opportunities for product type experience at the conclusion of the activity. Let’s not put children into a box or ensure they have to be on one side or the other of our beliefs. This type of experience does not need to be included every day obviously but I believe there is room for this concept. I will always offer a learning program and experiences for children in care and indeed my own children that leans toward process art and play based learning experiences. But children have shown me repeatedly over the years that they don’t all learn or play in the same way – sometimes there must be room for something different. And I believe that is ok. I have had the unique privilege as both educator and parent to watch my twin girls play and grow – I see the wonder of the nature v nurture debate everyday. They are so very different and as they grow older I have had to change the way I offer experiences to each of them. They have had an early childhood full of play based learning , opportunities for messy, sensory play with no ‘end product expected’, hours of outdoor challenges and fun and yet one twin needed more. This twin needs structure and order and activities that challenge her thinking skills and problem solving processes -her whole body relaxes when she is engaged in activities like colouring in stencils (gasp!) or following steps to make something so it ‘looks’ as it should (gasp again!) I now offer these experiences to her because she absolutely thrives on them and when I look back across the years I see that she always has and she can easily become lost if she doesn’t have a goal to her craft. Open ended experiences can sometimes stress her – she often needs a goal. Does it mean she doesn’t also enjoy the process experiences and the joy of just playing? No. But if I wasn’t offering the product type art and craft experiences I feel I would be doing her a disservice – I would be stifling her personal creativity, the way that she prefers to learn. I would not be listening to her voice or supporting her to follow her individual learning journey. How do we know this about a child unless we are offering a range of perspectives for them to try? My other twin has many sensory processing challenges and we have worked with occupational therapists and other specialists from when she was very young to support her with those challenges. She learns and finds her voice best when engaged in messy, sensory open ended experiences that are more process based. I have had to expose her to those sort of experiences from a young age to help her overcome her sensory difficulties. It has been a difficult road at times. She craves large muscle activities and play before she can sit to focus and a colouring in stencil or any form of stringent product based art makes her feel inferior and frustrated. She gives up on it quickly. So she makes the choice not to engage in those experiences and I respect that. But the opportunity is there in case she wants to challenge herself and she occasionally does. What if she was not offered that opportunity to choose because I was to set in my own educational philosophy? What if I never challenged her? 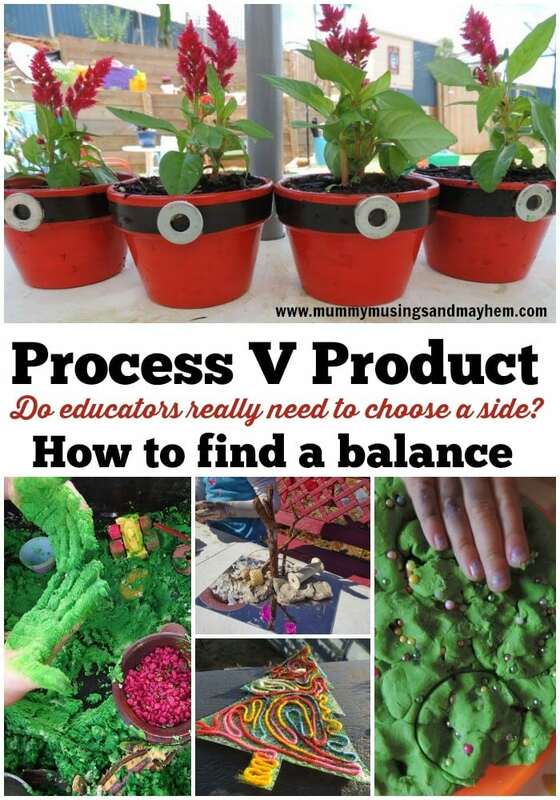 She will be entering the first year of school next year and I already know she is going to struggle with the product based element and expectations so I try to include Process for Product type experiences regularly now rather than just Process v Product experiences. 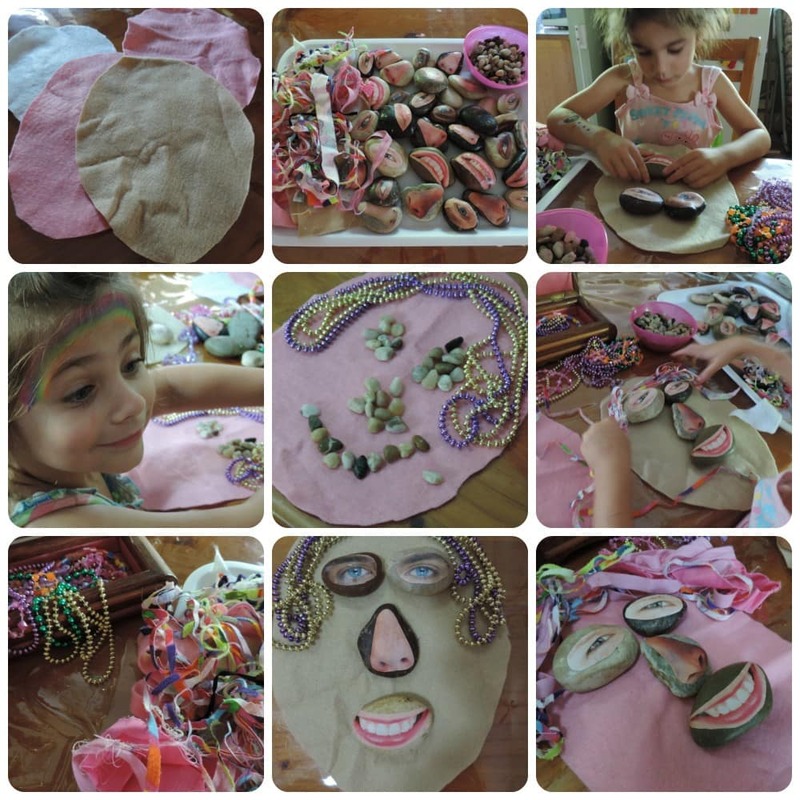 It can be difficult and requires me to think a little outside the box and challenge my own preference towards just offering process based craft but I believe being exposed to these crafts and activities will help support her when she enters the world of school next year. 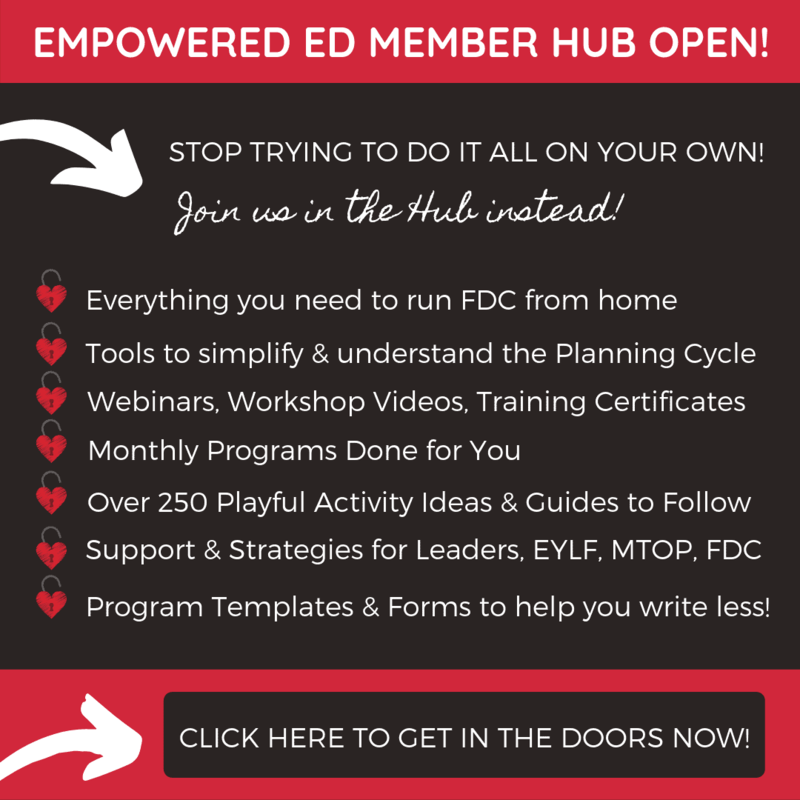 She will never like worksheets and colouring pages and neither do I – but the reality is she is about to be exposed to them on a daily basis (unfortunately) . It will challenge her yet my other twin cannot wait and is already creating her own ‘worksheets for school’. They are different, they enjoy their art and craft and even play in different ways. They both have the right to do so and it is my role as parent and educator to ensure I can offer them a mix of mediums to ensure they are not only supported but also challenged. I will never be convinced that only a product based approach is best for a child – the benefits of process orientated art is clear to all, but I also see the benefits and value of combining both, of offering children a choice, of including craft as well as art, of respecting their need to challenge themselves and explore their own unique self expression and creativity using a mix of both approaches. But it must be done well. 6 Strategies for using Process for Product experiences effectively! 1. Offer access to colouring stencils and templates for those children who like to explore this art medium but do not impose rules such as colouring within the lines or using certain colours for different object. Let the child explore the stencil in the way they need to using the tools they choose. Let them colour in the lines if they want to – some need to challenge themselves in this way but ensure they understand that is is not your expectation. 2. If using a themed craft ensure you are also implementing aspects of open ended art. Perhaps you are making Christmas trees using paper plates cut into triangles and green paint. Nothing wrong with that- themed product based craft can help a child follow directions, learn about the theme you are highlighting and challenge them to actively participate in steps needed to achieve a goal. BUT You can make it a process for product type craft by letting the child construct their own version of the tree. If they paste every triangle on top of another then leave it that way, don’t make it ‘right’. If they paint one triangle but not the others leave it that way. If they request another colour paint use it as a conversation starter and follow their thought process. If they are working slowly and meticulously to achieve a goal and are obviously enjoying the order of the activity and steps required then let them. If they seem to enjoy you helping them work to construct (as many children actually do) then be more involved. If they are happy exploring the craft in their own way then stand back and let them create rather than craft. There are many possibilities other than disregarding this type of craft disdainfully. Challenge yourself to think outside the box rather than to only see one outcome. 3. Allow room in every activity for self expression and creativity to emerge. You can still offer a product orientated craft with an overall end product in mind (usually educators to choose this type of craft around special occasions such as Christmas) but allow the child to deviate if they need to and ensure you are also providing plenty of opportunities for open ended experiences based around this theme or craft in other ways. Allow the child to use the materials provided in a completely different (yet within accepted safety guidelines)way to create something different to yours. 4. Strive for balance and use meaningful and effective observation skills. 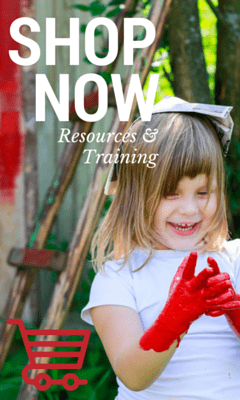 Know the children in your care – who loves structure and following directions and detailed crafts and who prefers to explore and create in their own way? Recognise that every child is unique in their learning style and that is ok. Provide experiences that embrace a mix of both to challenge the group as a whole. 5. If you are going to provide authentic opportunities to craft then do it well. Provide real tools (i.e hammer and nails, clay tools, sewing machine)and work alongside them to model their use. Use quality art and crafting materials. Provide opportunities for the child to manage risk and solve problems. Take the time to teach them the new skills required to achieve the outcome – but let them veer away if feeling stifled. 6. When offering a process for product craft experience ensure you have already asked yourself what you are wanting to achieve with this craft. It is ok for you to have a goal in mind but have you also considered if there is value for the child? Are you encouraging and supporting the emergence of new skills? Are you being authentic in offering this craft? Is it developmentally appropriate for the children you have in your care? Can you modify it or support children to modify it themselves? I hope this article has provided some opportunity for reflection. It is not my aim to change your mind or personal philosophy in any way but I do encourage you to engage in debate rather than a passionate argument over sides next time you see the Product V Process discussion emerging on a social media platform. There is no rule that you must only embrace one theoretical approach to provide a high quality learning environment for children. What you must do though is believe in the child and their unique capabilities and voice. Give them opportunities to show you by providing a balance of experiences – do not dismiss just because you do not learn in the same way. In my next post I will be sharing my thoughts on incorporating both process and product based experiences meaningfully and effectively into Christmas craft, art and gifts – and there will be lots of ideas and inspiration for you to visit and use from around the web. Don’t miss it! Jode, what a well written and thought out article. I take my hat off to you the way that you have articulated this whole dilemma of Process over Product. I think you have coined a new term “process for product” and I think it sums up beautifully how process and product can come together. Thank you for writing this article. This is great Jode. 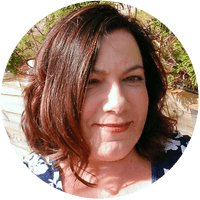 I am a little over how some bloggers tell me how I must do something with my kids, especially when it comes to product v process because I also see that both have a place in the way you have explained (much better than I ever could). And your explanation is so very good too, thank you! Hear, hear! Totally agree, Jode. So well written Jode!! Love your thoughts and couldn’t agree more. I think the most important aspect of this debate is for the teacher to know the difference in product and process. Teachers often don’t. I am a quilt designer by hobby and I have people all the time who want and need a pattern to create quilts. They don’t have the confidence or sometimes even want to make their own patterns. That’s okay. They can still happily enjoy the hobby of quilting. Being I am a designer, does that make me better….No. Does that mean that sometimes I don’t enjoy sewing a quilt of another person’s design…no. You are so right. Some people need to see the end the product to keep them working towards goal. Some people take our initial design and tweak it to make it their own. All aspects are great. Educators need to consider that children are the same….the most important is that children have opportunity for both. There truly is a place for everyone in the world. Thank you for such a wonderful post that adds depth to the discussions about product vs process art. I love the term product through process you used. I will certainly be sharing your perspective with other educators I work with. Perfectly written. I’m sharing with my teaching friends. Wise words. Thanks so much for your feedback and for sharing with others Jane!